As the NLG community knows all too well, the legal system often uses criminal charges and incarceration to quell dissent and undermine social movements. The new book, A Tilted Guide to Being a Defendant aims to educate and empower activists ensnared in the criminal legal system by providing practical guidance on how defendants can navigate and confront the system without compromising their activism. Below is a Q&A between Tilted Scales Collective member and Chair of the NLG Mass Defense Committee Jude Ortiz and NLG Communications Director Tasha Moro about the book. TM: What are A Tilted Guide to Being a Defendant and the Tilted Scales Collective? JO: The idea for A Tilted Guide to Being a Defendant came about at an Anarchist Black Cross (ABC) conference a few years ago, during a discussion on how the government has for decades used criminal charges to disrupt, destroy, and neutralize radical and revolutionary organizing. We realized we had to interrupt that process. We weren’t deluding ourselves that we would no longer have prisoners in our movements or no longer have to deal with the criminal legal system, though. Instead, a few of us resolved to create a guide for defendants that offered a way of confronting the inevitable criminal charges we’ll face with the aim of strengthening radical/revolutionary struggle. Following the conference, Tilted Scales Collective was formed—a small group of anarchist legal workers with years of experience supporting political prisoners and prisoners of war. We drew on our knowledge and experience to create outlines for A Tilted Guide to Being a Defendant (“the defendant’s guide”) and a companion guide for lawyers, which will be our next project. We solicited feedback from about 100 people nationwide, including about 40 current or former political prisoners/prisoners of war. TM: What are some of the social movements/activist experiences that inspired this book? JO: Our own involvement and experiences in contemporary radical struggles in the US directly inspired the defendant’s guide. Likewise, seeing comrades across the country being entrapped by cops and the FBI, or catching serious charges from militant actions, contributed to this impetus. But we knew that our struggles are part of a historical current that includes many other movements, such as Black/New Afrikan liberation (including Black Lives Matter), Chicano rights (and current struggles in Chicanx/Latinx communities), Puerto Rican independence, Native American sovereignty, animal and earth liberation struggles, queer/trans/gender non-conforming struggles, and on and on. We couldn’t include every struggle that inspired us, but we hope that the ones we were able to include inspire others. TM: What are your goals for the defendant’s guide? JO: We aim for liberation and the destruction of all systems of oppression and hierarchy, and hope that the defendant’s guide can play a part in this revolutionary project. We don’t expect it will end government repression—only abolishing prisons and the state can do that. But we do hope it can help defendants and their supporters figure out how to fight these charges in ways that can benefit the struggles they are a part of. This book was written in the spirit of resistance, and we hope it helps bolster the spirits of all those targeted by the state and facing the possibility of losing their freedom, health, safety, and/or lives—and from all those who they love. TM: Did your experience with the Guild influence this project at all? JO: Speaking for myself, my involvement with the Guild has definitely been important in the writing of this book and my efforts to get it (or more specifically, the ideas in it) out to those who will likely benefit from it the most. Many members of the Guild shared their wisdom as we were shaping our ideas for the book. I’ve been a member of the Guild since 2008, when I joined prior to the Republican National Convention (RNC) in St. Paul, MN. At that time, I was part of a legal collective that was helping organize legal support in advance of the RNC, and I also helped support the 800+ arrestees in the years that followed. Since then, I’ve remained involved in legal support and prisoner support, including helping with legal support efforts with the NLG for massive protests such as those against the RNC/DNC, NATO, and G20. More recently, I was elected as Chair of the Mass Defense Committee. These are scary times, and I’m glad to be part of the Guild now more than ever. TM: How can folks get a copy of the book? 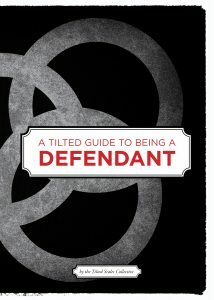 JO: A Tilted Guide to Being a Defendant is being published by Combustion Books in NYC (combustionbooks.org), where it will be available for purchase in the near future. The book is a fundraising project that will both support Combustion as well as Prison Activist Resource Center (PARC) (prisonactivist.org), a prison abolitionist project based in the Bay Area, CA. Additionally, it is being distributed by AK Press, based in the Bay Area: akpress.org. Prisoners or their supporters can order books through them by writing: AK Press, 370 Ryan Ave. #100, Chico, CA 95973. For those with internet access, we will also have an e-book version of the defendant’s guide available in the future.